Whether you've had your RV all your life or it is a new purchase; whether you bought it for a year-long trip across the country or for local weekend camping trips, there are likely going to be times when the real world calls you back and you need to find a place to park your RV. Because many of the neighborhoods in the Redlands area prohibit on street or driveway parking of the vehicle, RV owners must find a local storage facility. Vines Storage has become one of the premier facilities for RV owners who are looking for a convenient, safe, and secure location to park their vehicle. Not only is the location convenient with access that will have you back on the open road in no time, it is secured with a keypad entry, plenty of cameras, and a knowledgeable and friendly staff. Keeping your recreational vehicle safe and secure is our top priority. When your vehicle is on our site, you can rest easy knowing that it is safe from theft or vandalism. Our security highlights include 32 state-of-the-art cameras that scan the entire facility 24 hours a day. Furthermore, the facility is surrounded by an 8-foot brick wall, and an advanced alarm system. There is only one point of entrance, a gated entry where clients and staff must enter a key code to gain access. 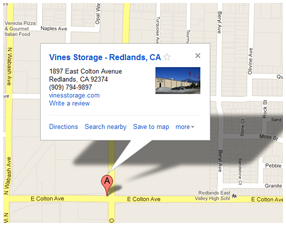 In addition to security and convenience, Vines Storage also offers plenty of amenities for our clients. Purified water and ice, air for your tires, a place to dump waste, and many more conveniences are all located right here on our site. There's no need to make an extra stop before your trip. Finally, our facility also offers convenience in leasing options as well. Whether you need lifetime weekday parking or short-term parking between vacations, we can customize a lease agreement to your needs. For more information about Vines Storage, our leasing options, our various storage units, or the many reasons you should choose our facility for your storage needs, call us today.